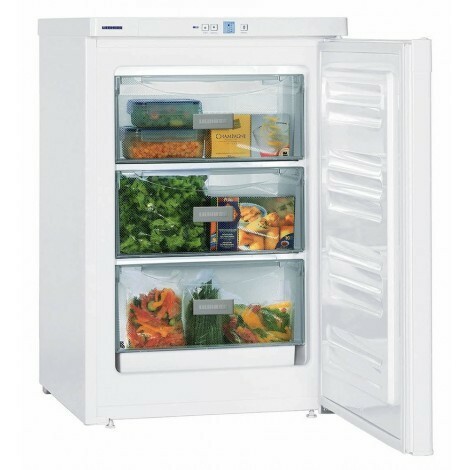 The under counter Liebherr GP1213 Freezer has a 98 litre storage capacity and three FrostSafe drawers for organising your frozen goods. With the FrostSafe, the extra-high and removable drawers are closed all round. This means that the cold cannot dissipate so quickly when the appliance is opened. The transparent front of the compartments guarantees an optimum overview of the frozen items. The freezer then switches back automatically to the normal mode. Compared to other static freezers, Liebherr’s SmartFrost technology freezes food faster, and reduces ice build-up, making defrosting simpler and quicker. It also provides a more flexible storage area with greater capacity and improved energy consumption for lower running costs. This freezer is A++ rated for energy efficiency and to ensure your food is always kept in optimum condition there's an optical malfunction warning signal. Its VarioSpace feature gives you the flexibility of removing the drawers to accommodate larger items. The automatic SuperFrost function makes freezing simple and saves energy. It quickly reduces the temperature to -32 °C and thus creates the cold air required to preserve vital vitamins. As soon as the food is completely frozen, the automatic SuperFrost function switches back to normal mode after max. 65 hours, and thus assists in saving electricity. The reversible door also allows you more options when placing the freezer, you can have the door open from both the left and the right. The child lock is programmed so as to prevent the appliance being inadvertently switched off. A symbol in the MagicEye indicates when the child lock is switched on.